HomeGold IRA BlogBarsWhere Does My Gold Go? When you buy gold, silver, palladium, or platinum for your IRA, you’re not allowed to take physical possession of the precious metal until you begin distributions after the IRS-defined retirement age. Until then, IRS guidelines stipulate that the metals must be stored in a licensed and approved third-party vault or depository. But what is a depository and where does your gold actually go? Read on to find out more. 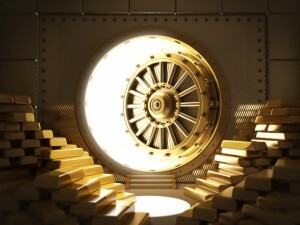 A depository is a highly secure storage and warehousing facility for precious metals. To be approved by the IRS, the depository must meet or exceed rigorous standards regarding security and accountability, and must submit to regular inspections and examinations to ensure ongoing compliance with guidelines and to maintain its charter and licenses. What kind of security measures do depositories offer? Though the specific security systems vary from facility to facility, you can be sure that any IRS-approved depository has numerous state-of-the-art protections in place. For example, physical security measures may include bulletproof doors and windows, concrete-reinforced steel walls, and impenetrable vaults with time locks and automatic re-locking mechanisms. Electronic security measures may include 24/7 surveillance, motion and vibration detection, metal detectors, and a complete database of employee profiles and images. Which depository does American Bullion use? American Bullion works exclusively with the Delaware Depository Service Company (DDSC), which is located in Wilmington, DE. The DDSC is the largest depository outside of New York City, and has a well-earned reputation for top-notch security, warehousing, and processing capabilities. When purchased through American Bullion, the gold you add to your IRA is sent to the DDSC, and it is stored either in a segregated or non-segregated account of your choice. If you choose to have a segregated account, the specific gold coins you buy are stored separately from the coins other investors buy, and when you take physical distributions after retirement, you will receive those exact same coins back. In non-segregated accounts, the metals are commingled in your custodian’s private section and are sorted by type. Silver products, coins or bars, are always commingled regardless the type of the account. Lastly, all bullion is fully allocated to the account holder and held off-balance sheet. As you can see, when you buy gold for your IRA through American Bullion, it goes to a highly secure and insured facility with several layers of redundant protective measures in place. There’s no better way to keep your precious metals safe over the long term, so invest with confidence today.